At Our Brewhouse, Birds of A Feather, Dine, Drink, work and Nest Together. Located in downtown Rockford in the heart of the exciting Madison Street Corridor. Prairie Street Brewing Co.’s famous “brewhouse” is home to craft beer, hand-crafted food, good vibes and a sense of purposeful community. Built on the east bank of the lovely Rock River by an English immigrant brewer named Jonathan Peacock in the mid 1800’s, it has been lovingly restored by skilled local architects and craftsmen. 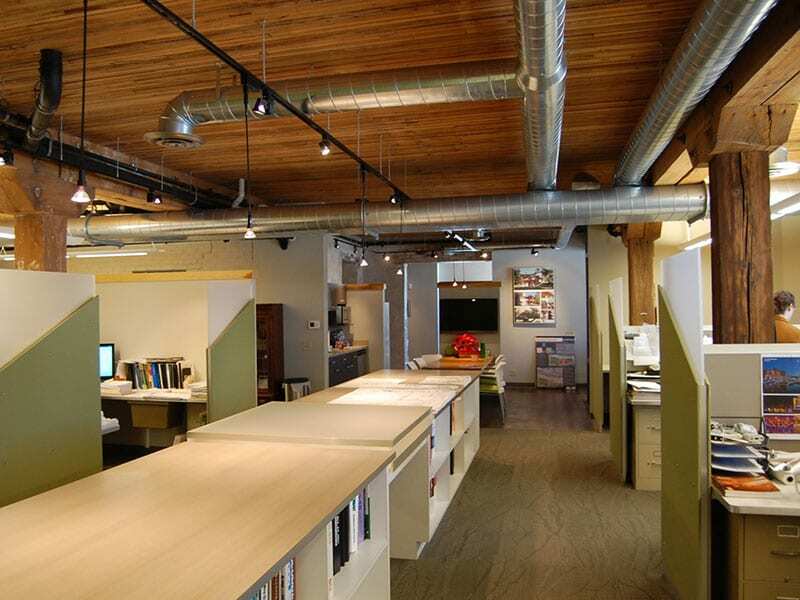 The stately old building is a shining example of both purpose-built efficiency and inspired adaptive re-use. The list of things you can do at Prairie Street Brewing Co. is long: drink locally hand-crafted beer; dine on delicious, locally sourced food; host a wedding, meeting or special event; live in a loft-style apartment; work in a riverfront office space; dock your boat permanently or just for a visit. To make reservations for lunch and dinner or to book an event or wedding, please contact us or call 815-277-9427. For information regarding living and office spaces or permanent boat storage, contact us or dial 815-277-9427. With expansive interior glass windows giving visitors a front-row seat into the good, bad and the ugly of our brewing process (the only ugly is when the brewers get in a food fight – and the only bad is the rare day when something’s not brewing) the main Brewpub at Prairie Street Brewing Co is the perfect spot to enjoy our famous, freshly crafted beer. On any given day, you might sit next to somebody at the bar from out-of-state – or out-of-the-country – or a Real Original Rockfordian. One thing you’ll more than likely have in common is a passion for great craft beer and freshly sourced, hand-crafted food. For those rare individuals who don’t love beer as much as we do, we have a full bar and a welcoming wine selection. Of course, the full kitchen menu is available until close weekdays and late night menu is available until midnight on the weekends. The brewpub’s exposed brick walls and big, arched exterior windows offer warming natural light, date back to the days when Jonathan Peacock built the building. It all adds up to a cozy yet exciting environment that has prompted so many people to say, “man, this does not seem like Rockford!” Come join us and be among birds of a feather at Prairie Street Brewing Co. Location, Location, Location. 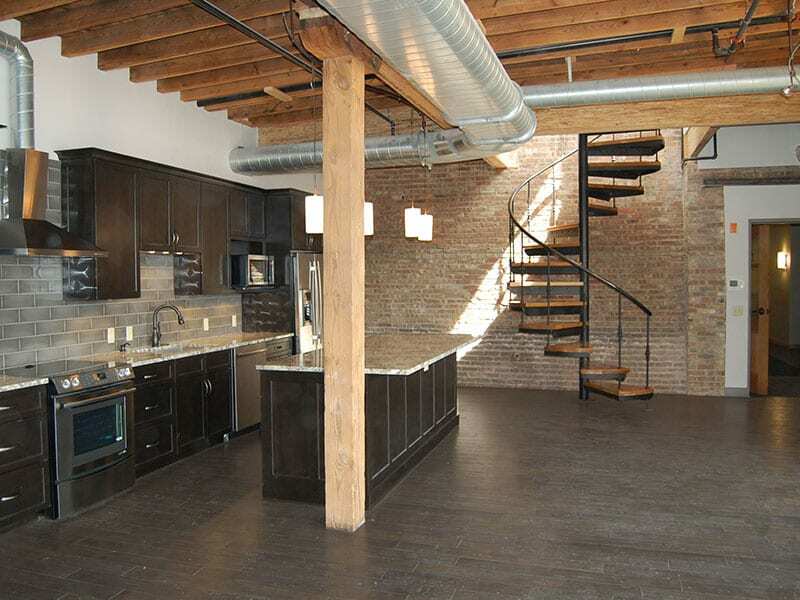 Loft Living Is Grand At Prairie Street Brewing Co.
Centrally located in the heart of downtown Rockford’s cultural corridor on Madison Street, loft living at Prairie Street Brewing Co is convenient, secure and fun. 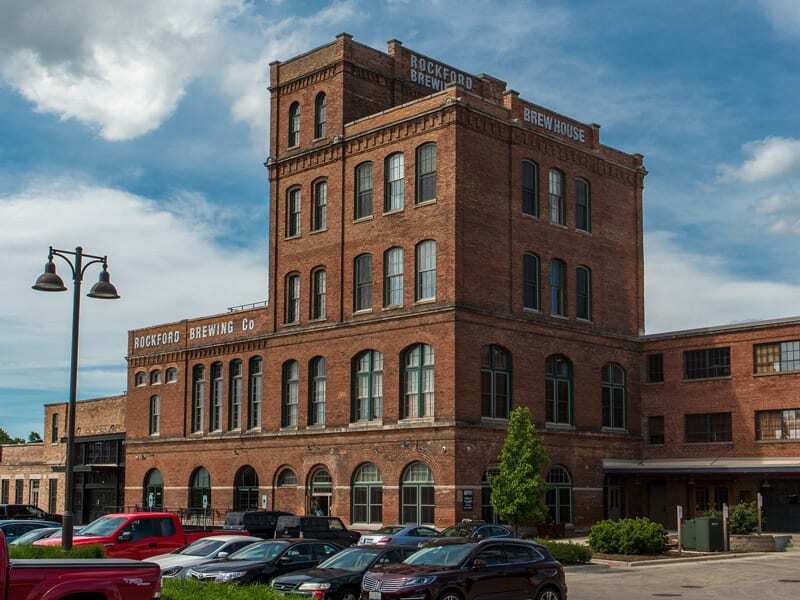 Outside of the fact our apartments are well-appointed and cozy, there’s something kind of cool about living in a National Historic Landmark building above northern Illinois’ finest craft brewery and brewpub. When you invite guests for a visit, you’ll have a host of options in which to entertain beyond your own living space: the lovely main Brewpub, Dockside Taproom, and the riverside dock itself. Our apartments are in extremely high demand, but please reach out via lofts@psbrewhouse.com or dial 815-277-9427 to check availability. Come By Land! Come By Sea! Prairie Street Brewing Co Has The Friendliest Marina In Town. Prairie Street Brewing Co offers 40 secured boat slips, a wonderful deck and the only gas on the Rock River in the city of Rockford. 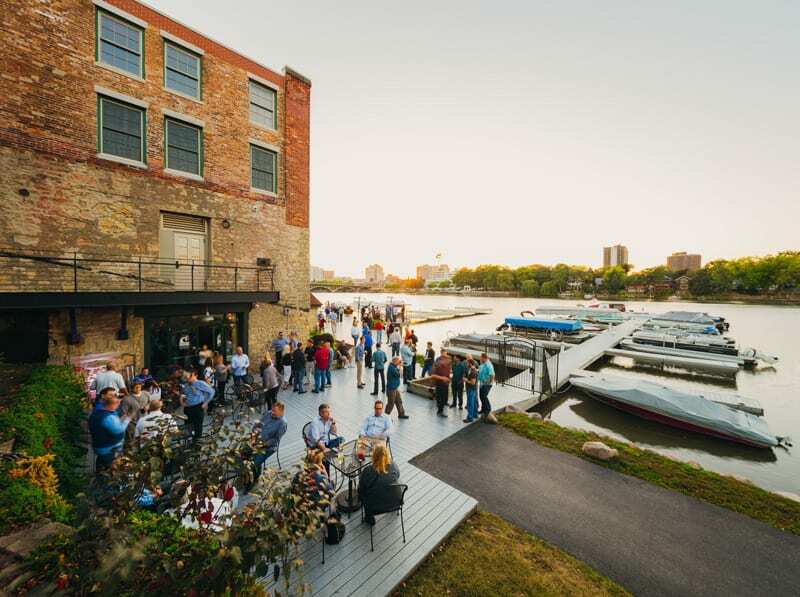 During the summer months, the Prairie Street Brewing Co marina is THE place to be on the river, with easy access to everything you need from fine craft beer to hand-crafted food to fuel to a place to live if you’re so-inclined. Each of the two docks have their own locking gate, and there is access to water and power at each slip. If you would like more information about our marina or gas sales, contact us or call 815-277-9427. Mon-Thu: 10:00 a.m. – 5:00 p.m.
Fri-Sun: 10:00 a.m. – 3:00 p.m.
In-person: ask Dockside Taproom staff on south side of dock for assistance. All Work And No Play is Not Even Possible If You Lease An Office Space At Prairie Street Brewing Co.
Prairie Street Brewhouse is the perfect place to locate you business. Our office suites are secure, well-appointed and offer the added advantage of being located in a National Historic Landmark building. There’s also something cool about working above northern Illinois’ finest craft brewery and a restaurant that is gaining in its reputation for expertly hand crafted food. 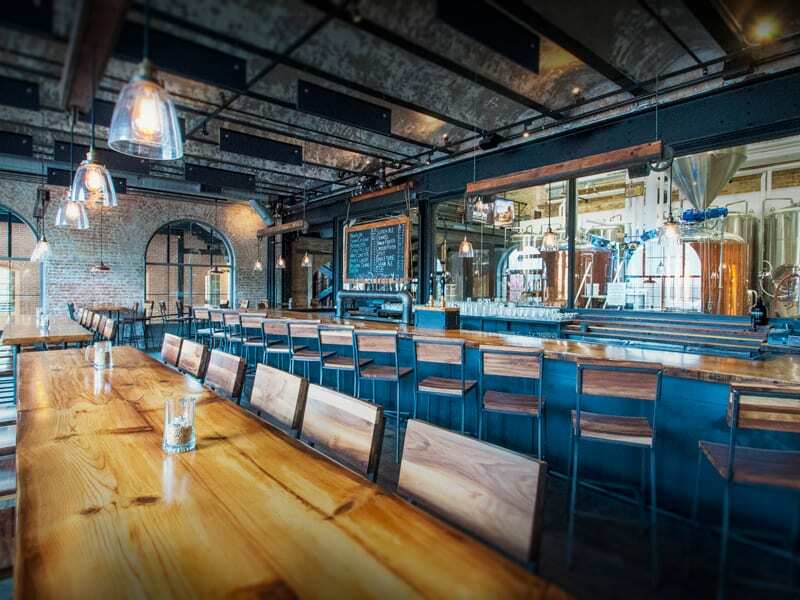 When you invite clients for a visit, it’s like having a host of options in which to entertain beyond your own work space: the brewhouse pub, Dockside Taproom, and the riverside dock itself. Our office spaces are in high demand, but please contact us or dial 815-277-9427 if you would like to check availability and to perhaps be placed on a waiting list.